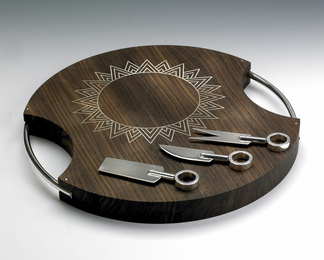 Award-winning silversmith Shona Marsh specializes in high-end, contemporary decorative and serving pieces inspired by clean geometric lines and patterns. 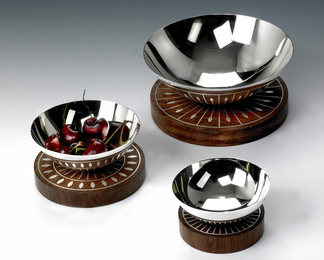 Her sleek designs – which combine silver and fine woods – are derived from the exploration of circles and spheres, which she slices, segments or repeats to create an arresting tablescape. 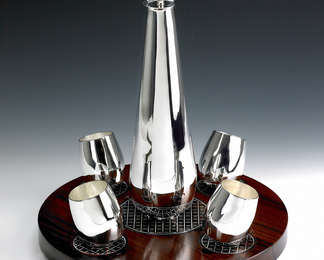 Shona’s artistic flair and refined artistry has won her a legion of high-profile fans. In 2010, she was commissioned by England’s Birmingham Museum and Art Gallery to create a Papal Cross as a gift for Pope Benedict XVI during his U.K. tour. The piece now sits in the Vatican. She also has produced original pieces for Lichfield Cathedral in Lichfield, Staffordshire, England and the Stoke Museum in Stoke-on-Trent, Staffordshire, England. 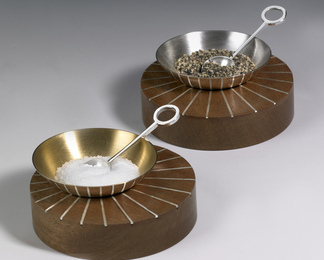 She is the recipient of many industry accolades, including The Goldsmiths’ Council Craftsmanship & Design Award and The Lonmin Design Innovation Award. 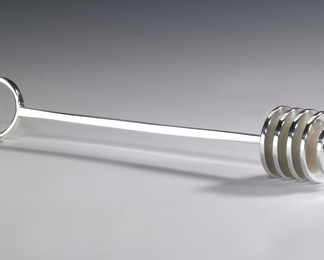 After completing a fine art degree at Edinburgh College of Art, Shona specialized in silversmithing at Birmingham Institute of Art & Design’s School of Jewellery. She set up her workshop in 2005. Shona Marsh is based in London, England.